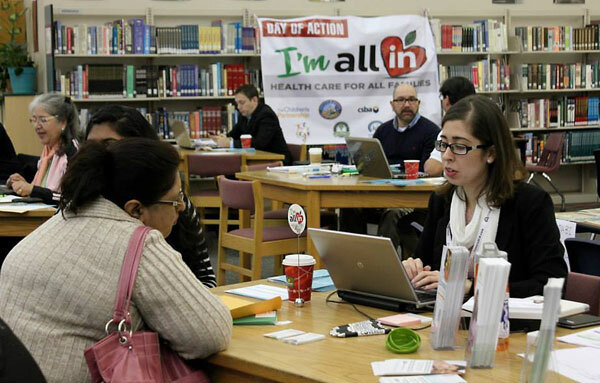 Parents in the Natomas Unified School District talk with health insurance enrollment specialists in 2015. 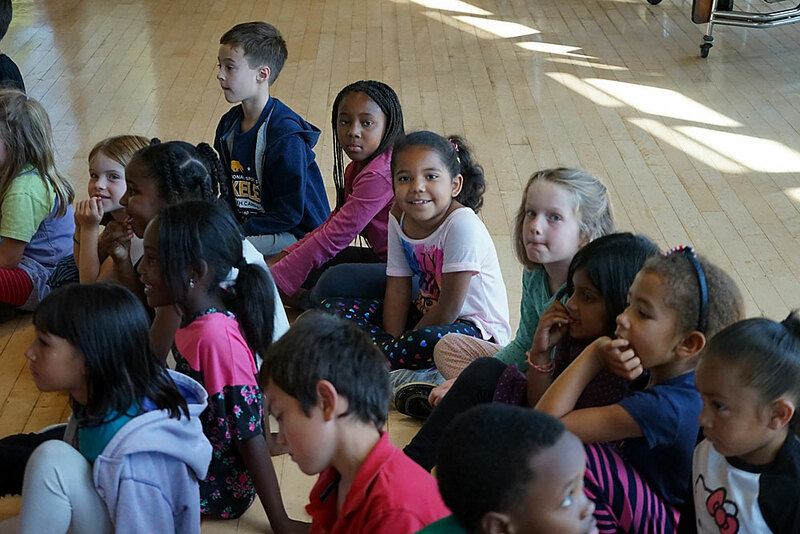 Lengthy, complicated and expensive programs are used in schools every day to improve student performance, but last week the U.S. Departments of Education and Health and Human Services kept it simple. If schools want to take one action to boost student attendance, health, behavior and learning, they should help uninsured students enroll in health insurance, the departments said. Identifying students who are uninsured and helping their families apply for insurance is “high-impact opportunity No. 1,” according to acting U.S. Secretary of Education John King and Health and Human Services Secretary Sylvia Mathews Burwell, who released a joint guidance letter and a toolkit to encourage schools to strengthen “the critical link” between health and education. Insured students benefit schools because they are healthier and less likely to be absent, according to research. And now under a new state law, Senate Bill 276, when students are insured under Medi-Cal, school districts will be able to collect reimbursement for routine school health services, potentially including visits to the school nurse or vision screenings — as soon as the California Department of Health Care Services and the federal Centers for Medicare and Medicaid Services come to an agreement about exactly which services will be covered. The push from the U.S. Departments of Education and Health and Human Services to insure students comes as the Jan. 31 deadline approaches for adults to obtain health insurance or face a tax penalty. In California, uninsured adults may select a plan through the Covered California private health insurance marketplace, which was created under the Affordable Care Act. Enrollment in Medi-Cal public health insurance occurs year-round for adults and children who qualify financially, and can be completed through the same Covered California application. Identifying students who are uninsured and helping their families apply for insurance is “high-impact opportunity No. 1,” according to acting U.S. Secretary of Education John King and Health and Human Services Secretary Sylvia Mathews Burwell. As of 2014, 437,000 children in California remained uninsured and “the overwhelming majority are Medi-Cal eligible,” said Mayra Alvarez, president of The Children’s Partnership, a national nonprofit child advocacy organization that is coordinating school outreach efforts through its “All In” campaign. On May 1, students who are undocumented also will become eligible to enroll in Medi-Cal, which Alvarez said is likely to lead to a surge in enrollment. One school outreach effort is newly required – as of fall 2015, schools must add to their student registration forms information about health insurance enrollment assistance, according to Assembly Bill 2706. More than 1,200 uninsured students in the district were referred to insurance enrollment assistance, according to the federal departments, which cited the Mountain View district experience in the toolkit as an example. Students who have private or public health insurance – and dental insurance, which is required in insurance plans offered under Covered California – miss fewer days of school because of being sick or injured and are more likely to finish high school, graduate from college and earn more money than those who are uninsured, according to research cited by the departments in their guidance letter, including this 2014 paper from the National Bureau of Economic Research that tracked how children enrolled in Medicaid fared over time. “We know that healthier students are better learners,” said Mary Wakefield, acting deputy Health and Human Services secretary, who spoke at a media event about the new guidance and toolkit. That restriction was lifted when the federal Centers for Medicare & Medicaid announced a rule change in a December 2014 letter. Implementation required the California Department of Health Care Services to submit a “Medicaid State Plan Amendment” to the federal Medicaid office, which the department did in September 2015. The federal office responded in December 2015, and negotiations about proposed covered services continue. Once those coverage decisions are made, Senate Bill 276, which was signed into law by Gov. Jerry Brown in 2015, requires the California Department of Health Care Services to seek federal reimbursement for all Medi-Cal-covered services for students who are enrolled in Medi-Cal. As a former teacher and principal, King said he saw students struggling with asthma who didn’t get prompt treatment and “ended up in the emergency room and missed weeks of school.” Students with toothaches were “distracted” from learning and students whose families were dealing with addiction were struggling because they lacked mental health services, he said. “We are calling on state and local communities to increase access to health insurance,” King said. Updated Jan. 27, 2016 to indicate that the billing changes will not be implemented until the California Department of Health Care Services obtains necessary federal approvals. Great article on steps to Student Health Insurance. Well said Jane! Here is an article about help students get health insurance Read this!